I KNOW I've talked about my bathroom "issues" here before. And no, I'm not talking about my own bodily functions, thankyouverymuch. I'm talking about the issues I have living in a house with 4 males. Actual picture taken in the boyz' actual bathroom. Just be thankful it isn't scratch and sniff. Just this morning, though, I discovered an answer to my neverending quest to find out WHY MY BATHROOMS CONSTANTLY SMELL LIKE PISS. So my alarm had just gone off and I was rubbing the sleep from my eyes. I heard shuffling out in the hallway and realized it was Middle stumbling to the bathroom in a half-comatose state. And then I heard peeing. Which? Fine. He was peeing. Great. Goddammit, the pee was NOT going in the toilet, for what was lacking was that distinct sound of the urine stream hitting the toilet water - until he was about 3/4 of the way done, that is. Instead of arising to investigate, reprimand or clean, I just imagined the puddle I would find on the floor (and wall) and listened as Middle shuffled back to bed, bumping into walls as he navigated his way back. And then it hit me. Pehaps I could INVENT some sort of device that would rig up to the toilet where the boys would have to stick their ween into a tube (I'm thinking like a toilet paper roll shape) (but plastic) (and dishwasher safe, of course) (which would be adjustable for height) (and fine, girth as well) that pointed down so the pee would go directly into the toilet!!! I seriously think I have a moneymaker here, folks. Start placing your orders now. I live in a house of 3 males & myself. I COMPLETELY agree with this. We need to remodel one of our bathrooms soon, so I can STOP sharing a bathroom with the boys! I'd buy it. Our bathroom has had that smell ever since the three year old started using the potty. The heat yesterday made it almost unbearable. I would totally buy one! I think every mother who lives with boys has this same problem! I've always fancied the idea of some sort of electrical shock. Maybe buzz their feet a little of anything hits the floor instead of the bowl. But, I'm only dealing with a husband . . . maybe I'd have a little more sympathy if he weren't 30 years old. I share you pain with my 3 males. Why oh why can't they sit down???? Who ever decided it was a great idea to stand up and let urine flow out of your pants into a bowl miles away??? Seriously, have you ever watched a guy pee? It's hard to control the starting and stopping. SIT DOWN!!! The comment about the electric shock cracks me up! Teach them to clean it and put them on a schedule on a rotating basis. Have the son who is next to clean it inspect it to make sure all of it is wiped up. I have toilet bowl cleaner under the sink and a brush in every bathroom. They get out the Lysol wipes and wipe every part of the toilet. They use about 6 of them each time. My youngest is better at cleaning chores than the older two and he started at age 4. However, no matter what age, they will never learn to replace the roll properly or at all. I need one of these! As of right now, only one of my three boys is potty-trained, but I'm already having that problem to some extent. I can only imagine how it's going to be when all three of them are peeing in the toilet (or, um, not). I was in the bathroom with HRH one morning when he totally mis-aimed. I don't think me screaming "what the hell is wrong with you!!?" was constructive at all. 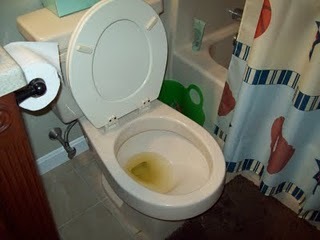 With girls, I don't have issues with the pee missing the toilet, but I still find toilets filled with yellow water! What is so gosh darned hard about flushing????? I have a feeling that I am going to need one of those for my house. My 3 year old has bad aim. I'll buy one! You are a sick woman...I actually trained Husband to hit just the side of the bowl rather than the water b/c it was making me feel like I was waking up in the middle of Niagara Falls! I was also convinced that his extremely loud peeing was waking up the babies...I was a Noise Nazi...still am! I'm concerned how a "tube" would morph around adolescence. Haha...gross! Funny, I was thinking of an electric mat they have to stand on and if any pee leaves the toilet and hits the mat, they get an unpleasant (though not dangerous) shock. Of course, this mat would be self-cleaning and smell like lavender when pee hits it; a nice girlie smell that makes little boys say "ewwwww" and makes them perfect their aim if the shock doesn't do it. the smell of pee in the bathrooms of our house is a constant battle. do they ever learn to aim? I have a 3 and 4 yr. old, and I'm hopin' it is something they outgrown? invent that and put me down for three, please. Oh...sounds good on paper...but...but...something that has your boys sticking their peepee into something...intuition just sounds alarms...just personal experience. I'll take 3!!!! LOL, love this post!